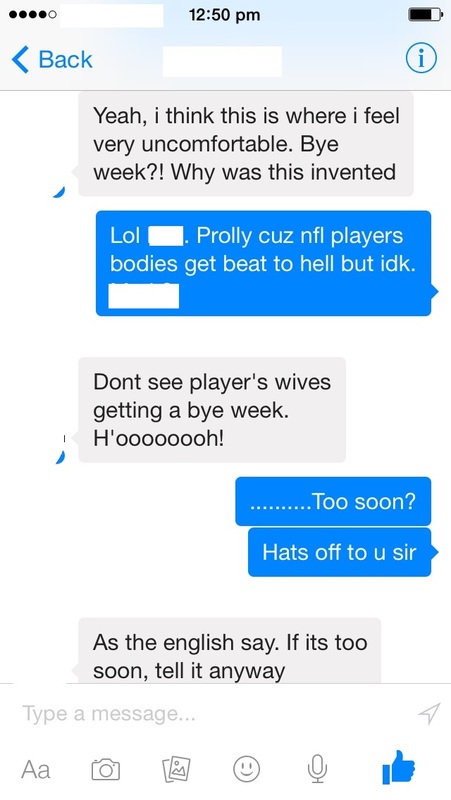 My English friend just took the piss out of the NFL so hilariously I can’t even…. So my husband and I have been teaching our English friend the ways of NFL Fantasy Football, which is apparently is much more complicated than like English Premiere League Fantasy Football. He’s come a long way since he auto-drafted, after which I sat him down and said, “Friend, you don’t need four defenses and two kickers.” That Englishman is 3-0! I should really stop helping him, especially since I’m 0-3 :(…. I feel like a disgrace to America. And the Packers lost last week, so it was a rough, rough week for SJC in the world of football. But my good, good English friend sent me this to cheer me up, which really does help a lot (though I hope it wasn’t a serious injury, I am a nice person, I swear). So anyway, this Facebook message exchange was prompted by my reminder to check his line-up since regular season Bye weeks start this week. Please excuse my ignorance about the actual reason for Bye weeks, lol, I googled it and apparently it’s done to extend the regular season. Please correct me if I’m wrong. It was just so hilarious, I had to share. It’s so fun teaching our friend the very, very complicated ways of the NFL.